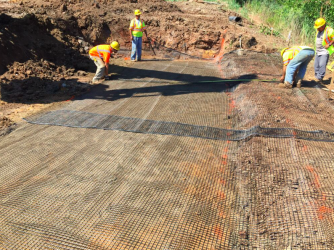 Maccaferri products are included in a project being installed in Woodbridge, NJ. Our MacGrid WG8, uniaxial geogrid, is being used in a reinforced soil slope (RSS) application for the New Jersey Turnpike Authority. Rather than use a retaining wall, they designers decided to go with a more natural looking RSS wall. After the install of the RSS, the construction crew covered it with rip rap stone. This solution saved money on the amount of stone they would have to use if it was a traditional excavating job where rock was added, layer upon layer. With the use of the RSS, a base was established and the stone was used to cover the geogrid. The project should be completed before the end of the year. 160′ long and 15′ at the highest point. 7,939 SY of the MacGrid WG8 was used. Final measurements 1.5′ high lifts with an 8″ overlap from side to side.